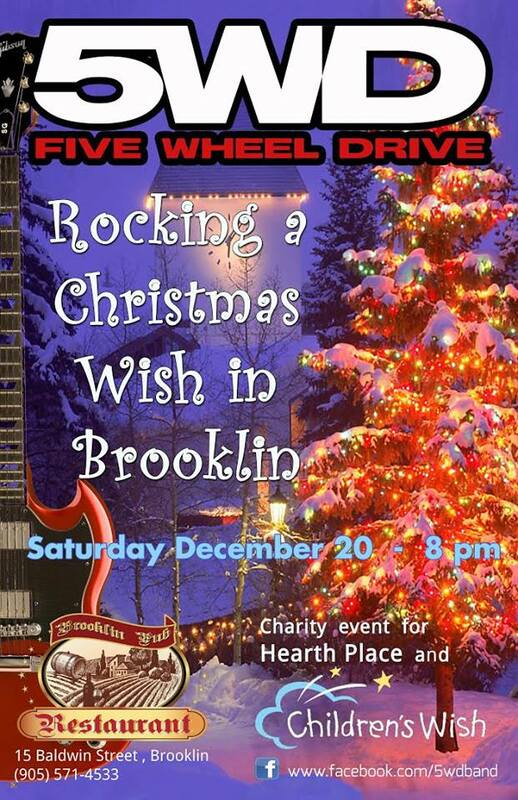 The band will be “Rocking A Christmas Wish” on Saturday December 20, when they visit the Brooklin Pub. This is the newest establishment in Brooklin and sports a very modern and new look. Five Wheel Drive will be hosting a fundraiser in support of the Children’s Wish Foundation and Hearth Place. These two local charities offer unmatched services to many families in the Durham Region area and the band wanted to give back to such worthy causes. Tickets for the event cna be purchased online at Event Brite’s Online Site or a very limited supply can be purchased at the door. The night will include a silent auction, live music and much more. The band hopes that you will take the time at this special time of year to support others that need it most. 100% of the sales of tickets and all other activities will go directly to these two charities.